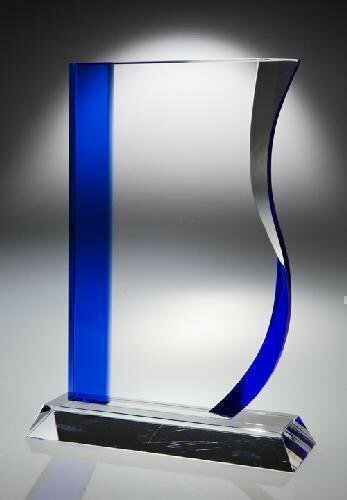 A stunning 9" tall crystal sculpture award with a wave access in blue/clear. 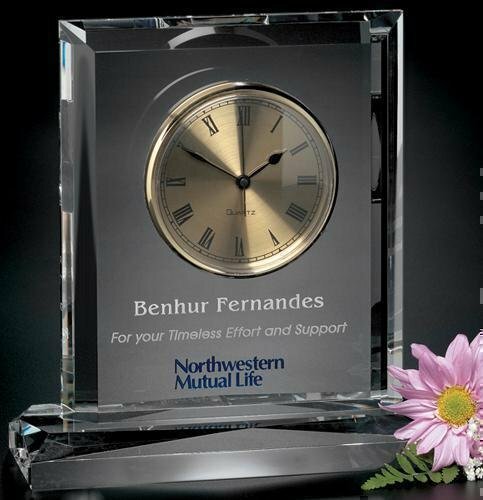 Customize this award with your own personalization text, logo or other artwork. You next award presentation is sure to be a hit. 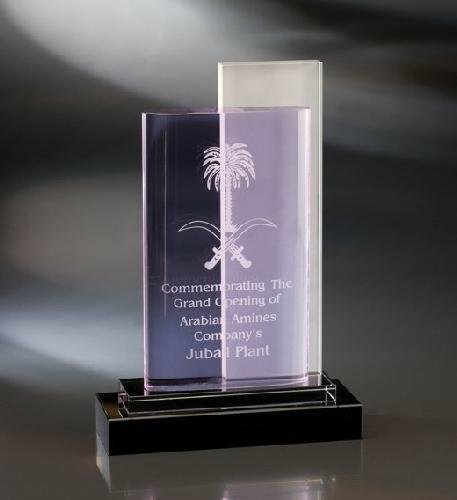 The Valera Award combines green marble with flawless optical crystal. Each slab of green marble in this award has its own unique color and white veins. Choose the Valera Award to honor individuals who have unique qualities similar to those seen in this award. The Vandalia Pyramid awards are handcrafted. 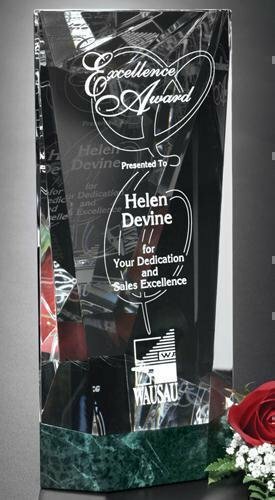 As a result, slight variations in veining and color give each award a distinctive quality. 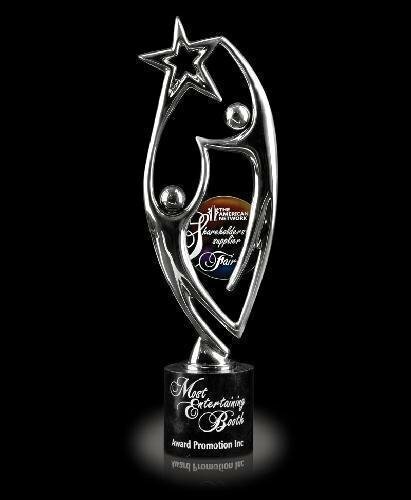 Consider this award to recognize the individuality of an achievement or milestone. 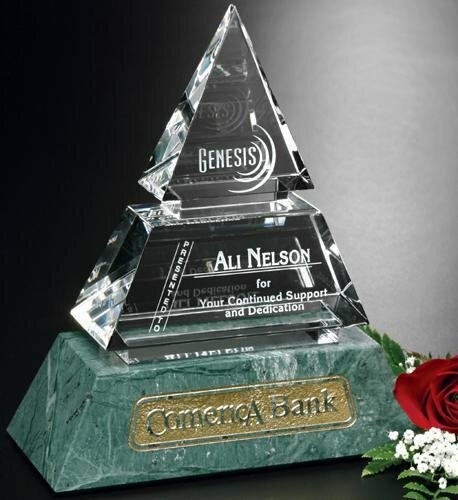 The marble in this award symbolizes a strong foundation, while the brilliant crystal aims upward toward the future. Recognize those within an organization who provide the knowledge, strength and vision for continued growth. This crystal timepiece is impressive due to its size and weight. It is sure to leave a lasting impression on any recipient. 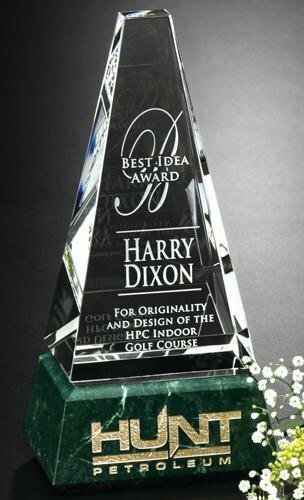 Teamwork and collaboration is what this chrome sculpture award is all about with fashionable colorful Art Glass on a black marble base.